SOAKING MUSIC - Anointed worship music for soaking in God's presence. Discover The Secret Place! Intimate songs of worship for meditating and soaking in God's presence. The Secret Place is not just a listening experience, it is a place of intimacy with the Father, a place where the heart longs for His touch. Take a little time to listen to the songs on the left-hand side of this page and soak in God. Our worship music is ideal for your personal prayer time, home groups, churches, or soaking prayer rooms, healing prayer rooms, or other similar soaking centers. Setting up a worship soaking room? More teaching and instructions here. Gentle music for prayer and meditation. Raw, spontaneous worship featuring beautiful singing in the spirit. Beautiful instrumental music featuring accoustic guitar. Add music players to your website or blog! Looking for More Soaking Music? 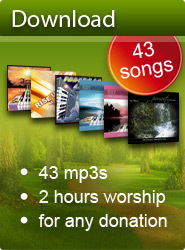 Visit our online store to listen or buy soaking music cds for meditating or resting in God's presence. This song is from the soaking album Seek My Face. Click here to listen and for purchasing options. What is Soaking Prayer Worship Music? Christian Soaking Music, is a sub-genre of Christian Music, that is used in prayer centres and other Christian meetings. The term encompasses any Christian spiritual soaking music that serves the purpose of creating an atmosphere conducive to resting in God’s Presence. The purpose is to set oneself aside to focus and meditate on God for renewal of strength and peace. It is an aid in seeking God. It is about spending quality time with God without having a program to maintain. It is a time to focus on a relationship with the Lord where lives are truly changed. "Take time today to draw aside and soak in the secret place of His Presence." When did YOU last experience the Father heart of God? Spend some time in His presence today! Experience His power and anointing and soak in The Secret Place. Listen online to these intimate songs on our latest collection of new worship cds. The Influence of the Soaking Revival in Christianity Today. This particular prayer movement is not yet prevalent in the majority of Christian churches. It is however making a huge presence among home groups and prayer houses or anywhere that groups of Christians gather to be in God’s presence. The Power of Soaking Praise & Worship Music to Transform Us. Spending quality time in the secret place of His presence is a major key in slowing us down long enough to allow God to get a hold of us and work some deep changes in our lives. Soaking in the Lord is about being in His presence long enough to enable us to let go of who we are and become more like Him. Anointed soaking in God's glory will transform us into His likeness. More worship music selected from The Secret Place in our online players - a great resource for those wanting to spend hours soaking. Spend time in His presence with these scriptures. Free guitar chords, lyrics, sheet music, download free mp3. Experience music with a spontaneous, creative, prophetic edge. Let you spirit be refreshed as you draw from the well of His Presence. Abide in His Presence and rest in Him. The anointing changes the atmosphere and shifts circumstances. Experience purely instrumental soaking music - perfect for relaxing in the peace of His presence. Take time to rest in His Presence. Instruction on soaking prayer setting - this resource includes an introduction to soaking which gives us a biblical basis for soaking and what exactly it is. It will give you key scriptures and walk you through getting into a more intimate relationship with God. It also gives a brief overview about Catch the Fire Ministries. Manuals also available. Your step-by-step guide to soaking in God's Presence. A selection of other Christian artists / bands and their recordings. Download all the written music from our first Secret Place album Seek My Face for free! We have made all the piano sheet music, guitar chords, tabs and lyrics for all the songs off this popular album available to you FREE OF CHARGE. Some of these songs make excellent choruses for Sunday morning worship, and for this purpose permission is given to make copies of this music for distribution to your local church musicians. "It is so anointed by the Lord, and has served to help bring me into the presence of the Lord in a mighty way!!! I keep the music on as I "soak" in His presence... the Holy Spirit becomes so real and present during those sweet times." you into a deeper encounter with God. Subscribe to our free podcast and feed your spirit with the sound of heaven.